The end of an era and a dynasty cemented. After a really good Game 1, the 2018 NBA Finals became a lot more of what I expected. LeBron James and the Cavs had hope for the first quarter up until halftime in each game, but when Golden State came out of the locker room, there was no way Cleveland could keep up with them for the full 48 minutes. While Games 1 and 3 were closer, I never had a doubt that the Warriors would pull away in a very quick four game series. Let’s take a look at how they did it. Game 1- To be honest, luck. The Warriors came out expecting to be able to beat the one-dimensional Cavaliers in four games pretty easily, but James’ 51-point performance proved it would take a little more than showing up to the arena to win the trophy. Nevertheless, the Cavs made mistake after mistake down the stretch as they unraveled after an admittedly bad foul call. 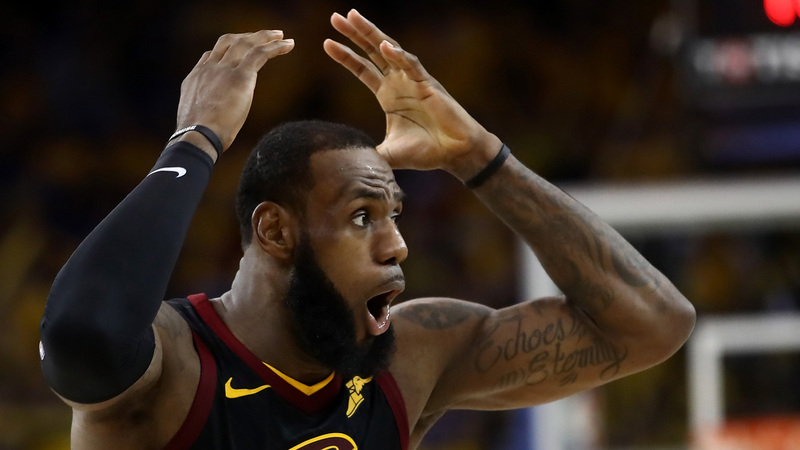 A Cleveland road win to kick off the Finals would have changed everything, but no matter which way you spin it, JR Smith’s infamous blunder at the end of regulation ultimately spelled the end of the Cavaliers’ season. Game 2- Persistence. After escaping disaster in Game 1, the Warriors were not about to be embarrassed on their home floor. They came out strong out of the gate making their first seven shots, and the Cavs never even got close. You’ve probably heard about how good the Warriors are in the 3rd quarter, so I found it interesting that the Cavs actually made some decent adjustments and won the period by 3. Still, Golden State stayed strong and continued to shoot well. Cleveland was torched by 19 by the final whistle, but there was still hope to get one back on their home floor. Game 3- Grit. I missed the majority of the Game 3 battle because I was working, but I got to a TV just in time to see Kevin Durant bury his 41st, 42nd, and 43rd points of the night on a late 3 to put the dagger in the Cavs. Despite trailing for the entire first half, the Warriors kept the Cavs close and were able to finally finish off the comeback in their deadly third quarter. However, the war wasn’t over as Cleveland wasn’t about to let Game 3 slip away that easily. In a back-and-forth second half, the Warriors never lost sight of the prize, and leaned on a crucial performance from Durant to put the Cavs in a seemingly insurmountable 3-0 hole. Game 4- Closing. Apparently, the series was over before this game started. With the way the Cavs approached this game, despite their false confidence in the press conferences, it was simply a formality for the Warriors to just show up and play an average game to close the door. While, granted, Curry had a spectacular showing, GSW won by 23 despite only scoring 108 points. Make no mistake, that’s harder than it looks. Up 3-0, it’s easy to play lazy with such a big cushion. But with the Cavs chucking 3s and failing to build chemistry or any kind of momentum, fans were treated to a pretty boring Game 4 that gave a steady build to a series sweep. Luck, persistence, grit, and an ability to close. Add it up and you have a winning formula for a dominant NBA championship run. Now winners of the Larry O’Brien trophy for the third time in four years, the city of Oakland officially has an NBA dynasty. Better yet, they’re not done. With all of the big pieces returning next year, the only drama in the organization is how long they will be together and how much money it will take to keep them there. On the other hand, Cleveland’s time with LeBron James is sure to come to an end. After a Herculean year for The King, James made it back to his 8th straight NBA Finals before being undone by his own players. With frustrations mounting, he broke his own hand in the locker room after Game 1, and is sure to sever his ties with the city he loves… for now. The world waits to hear who the greatest basketball player of this generation will take to the NBA Finals next year. This closes the book on Golden State v. Cleveland IV. The Warriors are on top of the world once again, and the other 29 teams will try to figure out a plan in the coming months to cut this dynasty short. Congratulations to the Golden State Warriors, 2018 NBA Champions! Me too LeBron, me too. 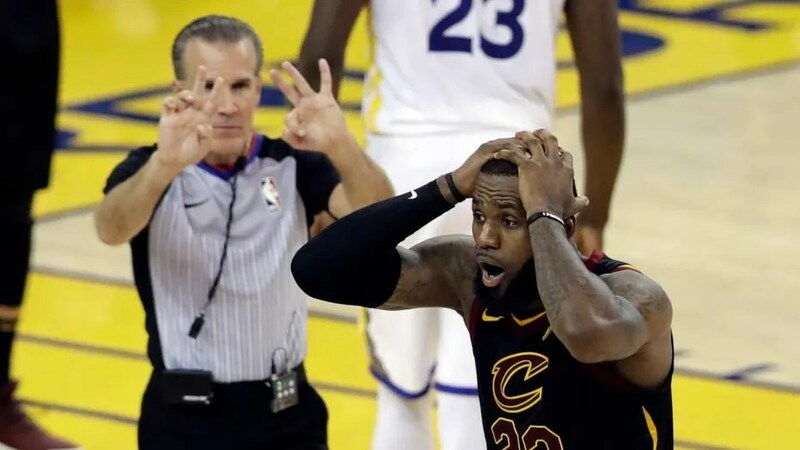 Game 1 of the NBA Finals was a whirlwind to say the least from a historic performance from The King that went by the wayside to another referee controversy. There’s a lot to discuss as everyone in the country tries to catch their breath and prepare for Game 2. Before we get ahead of ourselves, let’s take a look at what just happened. First things first: we got a basketball game on Thursday night, huh? Overtime in Game 1?? Check out my full predictions and you’ll notice I pegged the Warriors to win by 22 on their home floor. If not for that weird technical foul at the end, Golden State would have played all 53 minutes without so much as leading by double digits. So who stepped up for the Cavs to help make this a competitive showing? Well, still no one. LeBron James just decided to go off for a NBA Finals career-high 51 points… and he still lost. If nothing else, a close game shows that maybe, if everything were perfect, one man could just do it all by himself. Now, let’s walk through those final moments of regulation. I’m sure you’ve read all about it by now, but I’m going to throw my two cents in there. There’s 37 seconds left and James draws the charge according to the on-court officials in the heat of the moment. Regardless of whether or not that was the right call, it has to stand. Going to replay and overturning wasn’t only the wrong call, I’m pretty sure it’s not allowed. The refs blew the call. Period. However- and listen closely– The refs did NOT cost the Cavs the game. Bear with me, and I’ll get back to that. So, the call is overturned and Kevin Durant sinks his two free throws. Ball don’t lie or whatever you want, the Warriors tie the game at 104. Here come the Cavs with a 2-for-1 to win the game, and sure enough, James makes an easy driving layup to take the lead with enough time to get the ball back if the Warriors were to score. No harm, no foul. In fact, the Warriors did score. Steph Curry waltzed right up the middle and Kevin Love gave him a slap on the face to give him an extra point. Strike 1. Again, the Cavs have the last shot here. James predictably walks it up the floor, and he’s predictably blanketed by a Curry. There is no way he is getting a good shot off. In a moment of underrated brilliance that has now been overlooked, he gives the ball up. James finds a driving George Hill and forgoes his last shot in favor of his teammate. The greatest basketball player of this generation gave up the last shot in an incredibly trusting and unselfish act… and it worked. George Hill was fouled with 4.7 seconds remaining with a chance to take the lead. You know what happens next. Hill misses his chance. Strike 2. On a call that surely would be disputed if the game went the other way, the refs called Klay Thompson for a hold, and put the Cavs at the free thrown line to virtually win the game pending a possible last-second shot from Golden State. Unfortunately for Cavs fans, Hill was short on his second free throw and JR Smith got the rebound. Strike 3. Actually, there’s more. Five minutes more. The Cavs had 300 seconds to go out and win the game. They lost by 10. Strike 4. So, lets rewind the clock. Yeah, there was a controversial call with 37 seconds to go that went against the losing team. So be it. There was a call with 5 seconds to go that went against the winning team. Who took more advantage of their opportunity? That’s right. The Cavs had 4 chances to recover from that call. Yeah, it would have been nice if the refs made the right call but they didn’t. That’s basketball. That’s every sport. If you put yourself in a position to have the refs decide a game for you, it’s your own fault. They had 47.5 minutes before the call to build a lead, and they had 5.5 minutes after to get it back. They didn’t do it. A sincere congratulations on a close game Cleveland, but you’re pointing the fingers at the wrong people. That won’t get you any closer to a Game 2 victory. Alright, Game 1 is in the books. Judging by the scrappiness and frustration at the end, I think we’re going to see a very physical Game 2, and a lot of Draymond Green. Contrary to popular belief, Sunday’s showdown is very much up in the air. James may not get 50 again, and he still may not get help, but this series just got emotional. When emotions are in play, the secret is keeping a level head. James has done this more than a few times. Granted, so have the Warriors, but they have Green so you know. Who can get in their opponents heads without crossing the line? Who can do their job and frustrate the opposition with real basketball? Who is going to say, “To hell with the refs calls, we can still win”? I honestly don’t know. I’m sticking with my prediction for the Warriors for Game 2, and I recommend everyone out there do the same. We will see if this was their wake up call as they come out firing, or with Cleveland play like they have each other’s backs and avenge the mistakes Love, Hill, Smith, and even James made down the stretch. It was a team loss for the Cavs. Make no mistake, despite how close it was on Thursday, it will take a team to win on Sunday.